Tollcross Road, near Fullerton Park. 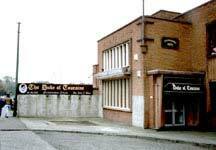 The Duke of Touraine was established in Parkhead in 1969. Another opened in Ingram Street with Sylvester's next door. The one in Tollcross Road is now closed down and became a Kebab shop. Also see The Duke of Touraine in Ingram Street.